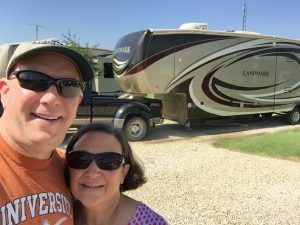 Us and our Landmark on June 22, 2016, the day we departed DFW on our full-time RV adventure. We are Cheryl and David, a couple in our mid-50s from Dallas, Texas. 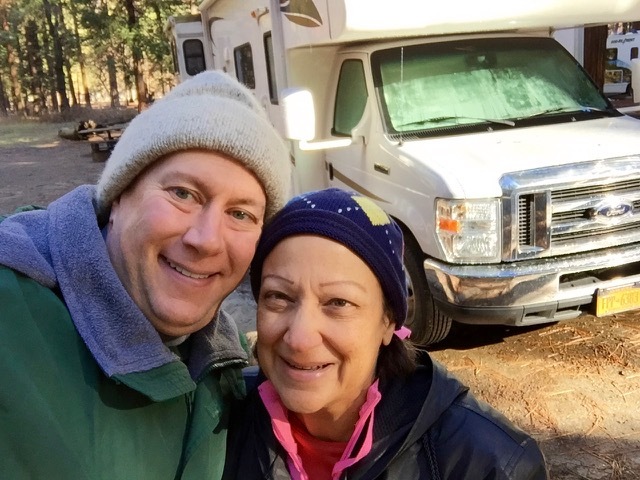 In June 2016, we sold our townhome, moved into a 41’ long recreational vehicle, and began an adventure as full-time travelers around this great country. What’s that you say? “Mid-life crisis”? Well, no, not really. It was actually the natural evolution of something we had been doing for several years before, although we didn’t quite realize it. The first part of our journey began in 2013, when we moved from our 3,000 square foot house to a 2,000 square foot townhome. Because we were downsizing, we started getting rid of stuff. A LOT of stuff, actually—probably one-third of what we owned, because that’s how much less space we were going to have. As we settled into our new home, we discovered that it’s actually easier to see the excess when it’s in a smaller space. Cheryl stumbled on a quote from late 1800s English artist William Morris, who said, “Have nothing in your houses that you do not know to be useful, or believe to be beautiful.” And we began to realize that we still had many things in our lives that were neither. That clutter was not just physical stuff—although there was still plenty of that—but also all the commitments and daily tasks that competed for our time, energy and passion, often squeezing out more important things like experiences and time with our family and friends. 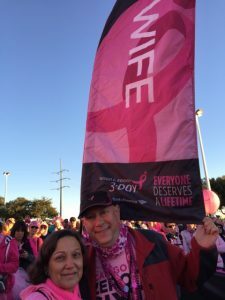 The second part of our story, though, was what really crystallized the need for change: when Cheryl was diagnosed with early-stage breast cancer and, shortly thereafter, when we nearly lost her due to a serious complication during her first surgery in 2014. Fortunately, she fully recovered, at least physically. But emotionally, we both still had scars. What if we hadn’t been so lucky? And what else might happen unexpectedly to one of us…and when? We can’t know, of course. But that uncertainty forced us to admit that the time we have is precious, irreplaceable, and finite. We’d been blessed with so many wonderful successes and exciting experiences together. However, we knew we wanted more. Much more. More than we could achieve in our lifestyle then, especially with David’s career, which—though he loved what he did, and he cared more about his company than any place he’d ever worked—kept us physically apart much of the time, and occupied David’s intellectual and emotional headspace most of the rest of the time. He was a serial entrepreneur in his 30th year of starting and leading companies, putting his heart and soul into his work, and being “always on”—even when (or perhaps especially when) he shouldn’t have been. We both realized that it was time to shift our priorities significantly to focus more on beauty and peace than on achievement. Clearly, we needed a dramatic change. And we found it in full-time RVing, which allowed us to combine our love of travel and discovering new experiences with a simpler, less frenetic and lower-cost lifestyle in which we could work less, and live more. We researched it extensively, and discovered that there are tens of thousands of Americans of all ages—from young couples to families with school-age children to retirees—who are doing exactly what we’re planning. There are businesses, services and, yes, even an online social network dedicated solely to the full-time RVer. We also took two long “trial” trips in rented motorhomes, and then in mid-2015 purchased a 41-foot-long Heartland Landmark fifth wheel trailer along with a big honkin’ Ford F-450 Super Duty to pull the monster. 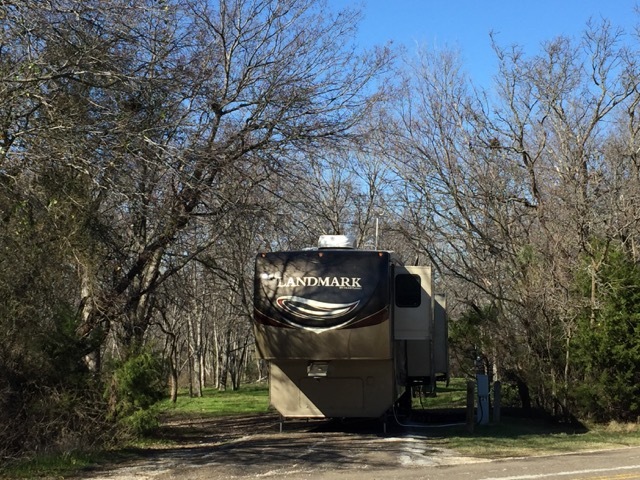 Lest you think we are roughing it, our rig features all the comforts of home—an island kitchen with microwave/convection oven, two TVs (with surround sound in the living room), a washer and dryer, a king-size bed, even whole-house wifi—in a compact and efficient 400 square feet. 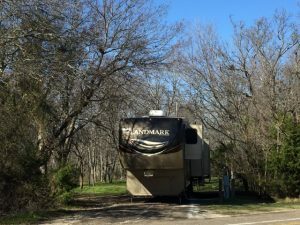 As a final test, we took a two-week trip in our apartment-on-wheels at the end of 2015, and after that we knew for certain we were making the right decision. We loved not being tied to a schedule, staying as long or as little a time as we wanted in any one place, and the serendipity that comes from being on the road. “But why now?”, a few of our friends asked. “You’re only in your mid-50s! Your peak earnings years are ahead of you! Why not wait until you’re 62, or 65?” True. But how much money do you really need—especially if you live a simple, low-overhead life? Fortunately, we’d saved well over the years, and I worked with an incredible company that wanted me to stay on part-time as a strategic advisor, mentor and coach. I’m excited that I’ll be able to continue to share in its future while still pursuing our new lives. Also, our nest is empty. We’ve raised two beautiful, gifted and independent young adults, and while we’ll always be no more than a phone call (or worst case, a plane ride) away when they need us, the truth is that there is no longer anyone waiting for us to come home every day. And finally, David’s mother and Cheryl’s parents are all still relatively healthy, as are we. God willing, that will all last for a long time. But we know it won’t be indefinitely, and that at some point in the future, we may not have the flexibility that we can enjoy today. This wonderful phenomenon we call life is a series of opportunities and trade-offs, risks and rewards, security and adventure. We believe that those who embrace all of that giddy messiness are the ones who, in their last days, will truly be able to say that they lived life with no regrets and as fully and deeply as it’s humanly possible to live.